The Ringtrough has no rotating joints or flexible piping connecting to the manifolds. The entire collector tube and manifold system is piped solid with no moving parts. The only exception is for the typical devices (sliding joints & expansion bellows/loops) associated with expansion and contraction, engineered in all high temperature steam generation piping systems. Eliminating flexible joints and supporting the collector tube independently allows for the collector tube to be increased dramatically in size, weight and strength, thereby allowing the seawater to be heated directly in the collector tube. 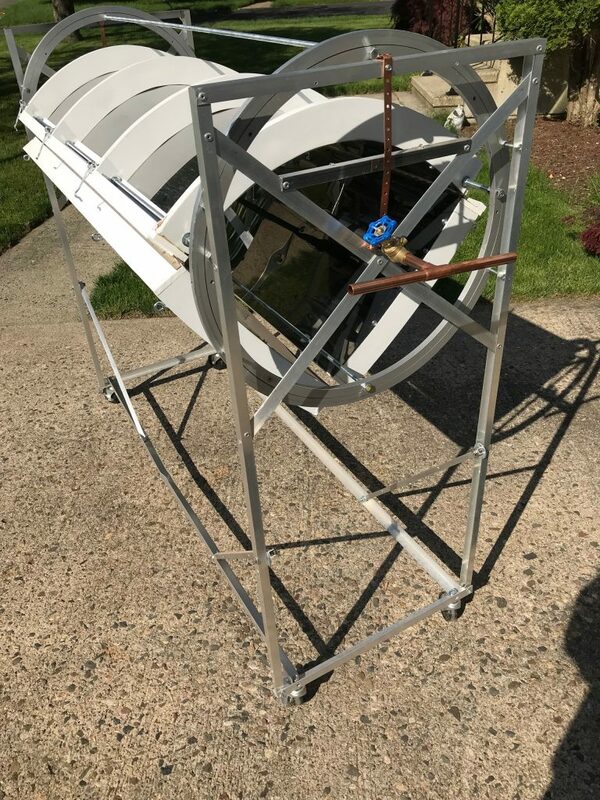 Heating the seawater directly in the collector tube eliminates the need for synthetic oil, along with the equipment to store, pump and transfer the heat. This eliminates the 15% loss of efficiency associated with the heat transfer of synthetic oil to seawater. Current Troughs can only rotate through about 200° of movement while the Ringtrough can rotate a full 360°. The advantage to full rotation is the ability to completely invert the trough during off-hours. This allows protecting the mirrors from inclement weather, including blowing dust and sand. Inverting the mirrors will also protect the collector tube assemblies and allow for easier access to the mirrors for cleaning and service. Current trough mechanical rotation devices are located along the central axis. The Ringtrough will be rotated by simple multiple mechanical devices engaging the rollers on each end of the trough at the ring beams. This will provide an inexpensive, robust and redundant system. The Ringtrough will be designed with the winged portion of the trough (outboard of the ring beam) to fold inward 90°, and seal the mirrored surface during off-hours and storms. This can be a particularly critical feature in desert environments where blowing dust is an issue. The mechanism for moving the wings will rely on the rotation of the ring beam for operation. The trough will be rotated until the hinge on one wing is inverted, unloading the hinge. Then the wing is unlocked, and the trough rotated to close the wing and locked in the folded position. The process is repeated for the other wing. Existing trough apertures are limited by a cost benefit analysis to approximately 6.77 m (23′). The Ringtrough prototype will be designed with an aperture dimension of 12 m (40′). Increasing the aperture by 75% increases the amount of solar gain on the collector tube by 75%. 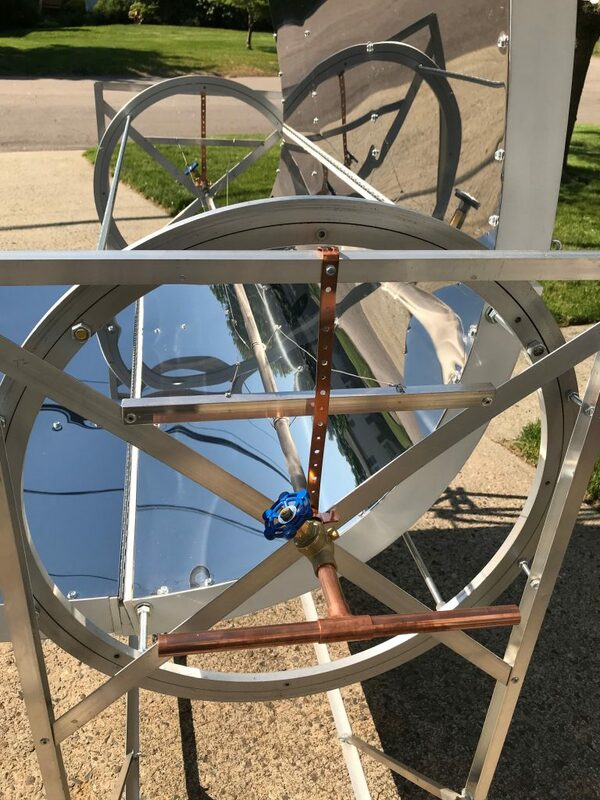 This increase will decrease the linear amount of collector tube required for the equivalent amount of solar gain, resulting in a substantial decrease in the size of the solar field for the equivalent amount of heat gain. Existing trough systems pivot on two points along a single line of support to rotate the trough. The Ringtrough’s ring beams connect to the support structure across multiple points, spreading the loads transmitted to the ground. This is particularly important when designing for wind loads. Since the Ringtrough aperture is 12m (40’), this requires a much more robust support system than existing trough designs. Conceptual design has the support towers as concrete 10m (32’) high. Existing troughs that are connected in series are required to rotate together between flexible connections. Each Ringtrough unit will be designed to operate independently. This will allow each mirror to be focused directly on the focal line or slightly off center, enabling each mirror to meter the amount of heat gain on each segment of the focal line. This is important to maintain a steady state in the focal line when clouds are passing overhead, and for multiple thermal fluid exits into a common manifold. A 12 m (40′) aperture with a 150 mm (6”) round cermet coated pipe placed along the focal line will multiply the sunlight by a factor of 80 onto the pipe. Seawater continuously fed into the pipe will be heated to 110°C (230°F), which is then sent through a pressure reducing valve and into a standard steam drum. This process is called multi-stage flash distillation (MSFD), which is currently used for 60% of the world’s desalination. The same process is applicable for water purification and water recycling and can be scaled up or down depending on need.